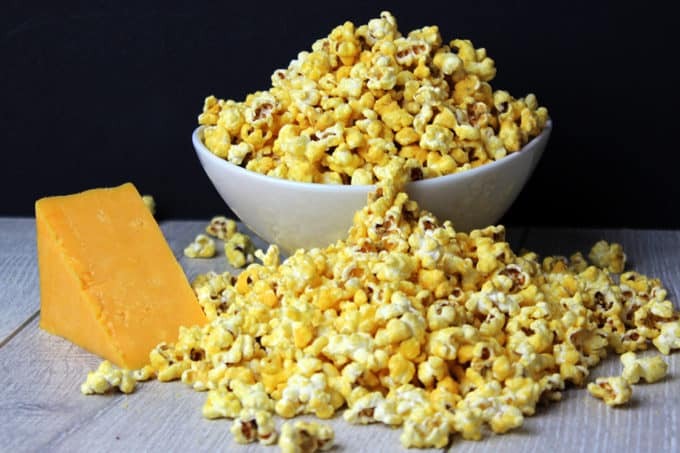 Easy Homemade Cheddar Cheese Popcorn, just like the kind you buy in tins at Christmas and it is made in just five minutes, completely in the microwave!Did you grow up with the tins at Christmas? Every year my dad would bring one home and my mom, brother and I would fight over the tin. My brother and I would immediately fight over the cheddar and caramel sections and get yelled at by mom to eat them all evenly. Ugh. Evenly. Who actually ever wanted the butter flavor when cheese and caramel were so close by? Then I discovered something amazing one day at the Summer Fancy Food show five years ago. G.H. Cretor’s Chicago Mix Popcorn. The people at the company were so nice and the taste was fantastic. 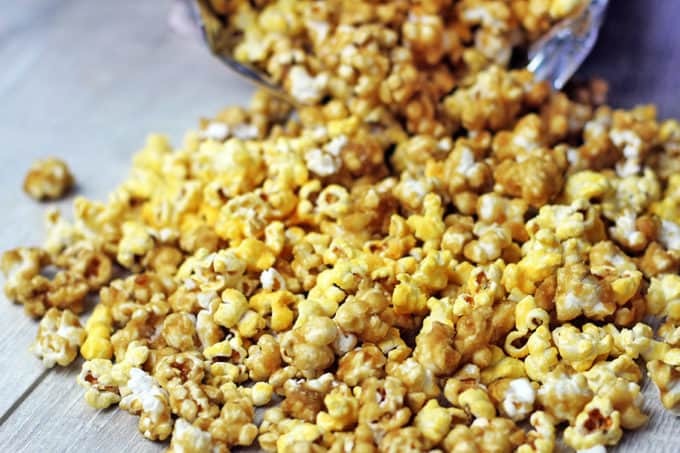 Plus it took the best parts of the popcorn tin and combined them in one bag which meant my caramel popcorn had a slight layer of cheddar cheese dust. YUM. But if you know me by now, you know I can’t leave well enough alone. The bags are not inexpensive and I love recreating my favorite foods at home so I set out to make my own version. 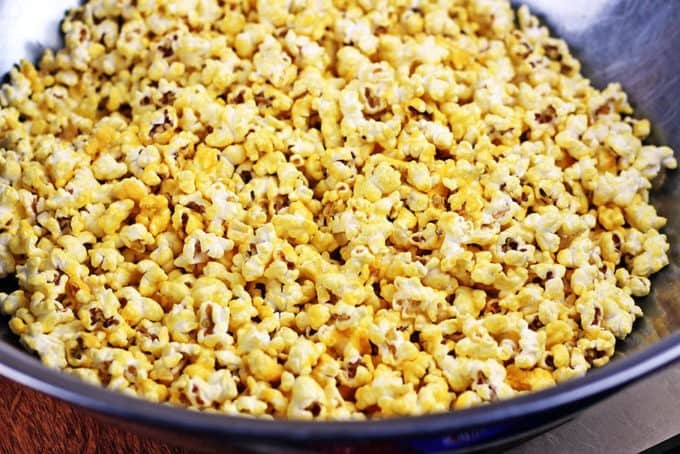 You know, something like this delicious Homemade Chicago Mix Popcorn!…. Don’t worry this Chicago Mix popcorn is coming soon to your favorite blog ever *cough*here*cough* so definitely come back for that later this week! 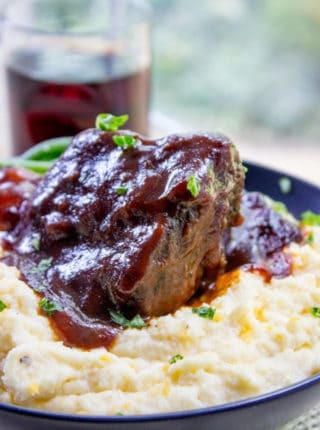 The best part is this recipe is so easy and takes just a few minutes to make. Completely done in the microwave, no less! Put a 1/3 of a cup of kernels in a medium brown paper bag. Roll the top of it closed. Microwave until the kernels stop popping at the rate of at least 1 per second. 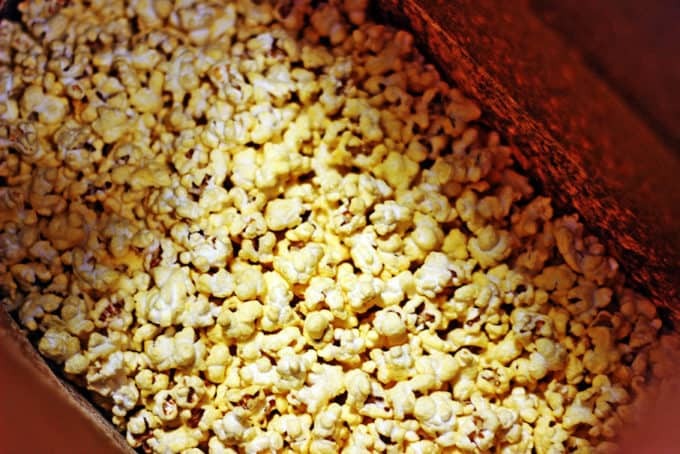 In a large brown paper bag, combine the popcorn and butter by shaking the bag while pouring the butter in a slow stream. Once all the butter is in, roll the bag closed and shake it REALLY well. 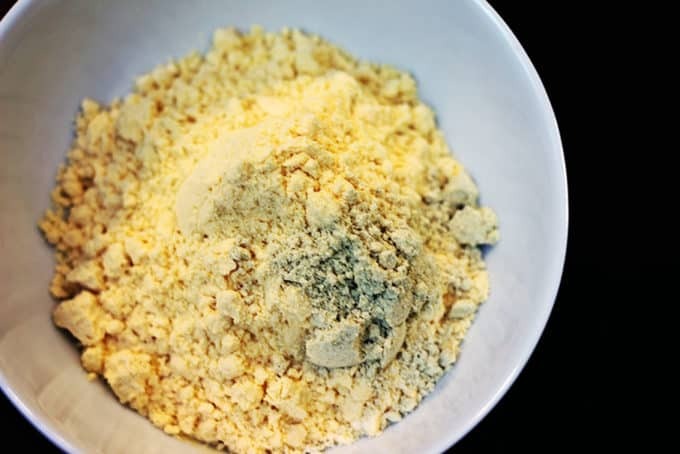 Combine the cheddar cheese powder, mustard powder and salt in a small bowl. Sprinkle over the popcorn while shaking the bag. Roll it back up and shake vigorously. Easy Homemade Cheddar Cheese Popcorn! Just like the kind you buy in tins at Christmas. 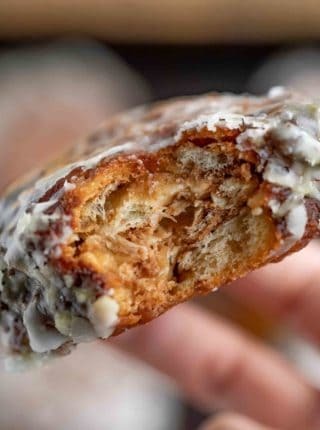 The best part is it takes just five minutes to make and is done 100% in the microwave! Put a 1/3 of a cup of kernels in a medium brown paper bag. Roll the top of it closed. 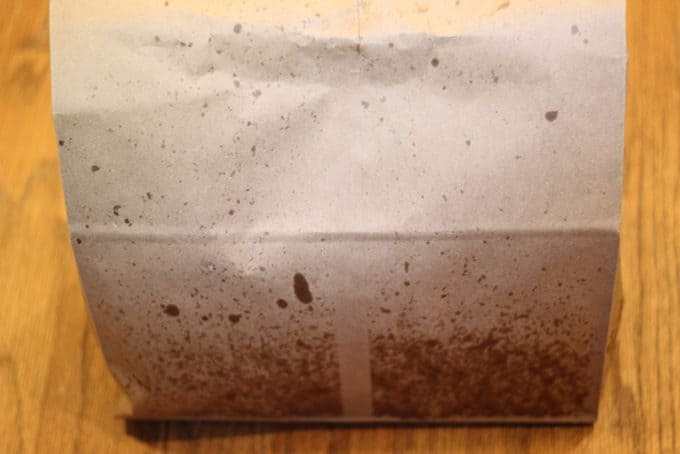 In a large brown paper bag, combine the popcorn and butter by shaking the bag while pouring the butter in a slow stream. Once all the butter is in, roll the bag closed and shake it REALLY well. Sprinkle over the popcorn while shaking the bag. Roll it back up and shake vigorously. I’m not sure because popcorn tends to get stale quickly. It really is best right out of the microwave, if possible. Maybe try sealing it in packaging as soon as it’s made to help keep it fresh. If you decide to try, I’d love to know what worked for you. Where do you get Cheddar Cheese powder. And if you use the boxed Mac & Cheese, what do you do with the Mac & no cheese powder? There’s a link below the recipe where you can order it from Amazon. And if you’re looking for recipes for elbow macaroni that don’t use cheddar powder, I have Super Creamy Mac and Cheese, Baked Mac and Cheese, and Hawaiian Macaroni Salad! Oh no! Sounds like the butter didn’t get fully disappeared on all the kernels. Next time, try and shake the bag more or harder to ensure the butter get mixed all over a little better. 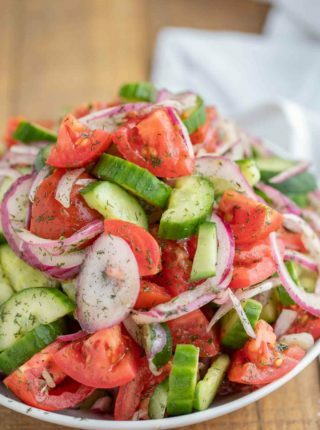 Can you make this ahead of time? 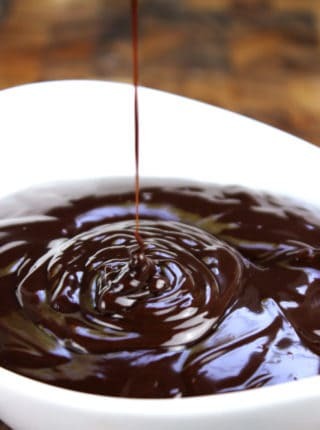 I am thinking of making this for a graduation party. I’m not sure because popcorn tends to get stale quickly. If you decide to try, I would suggest sealing it in packaging as soon as it’s made to keep it fresh. It really is best right out of the microwave, if possible. Let me know how it turns out if you decide to try it. Wow! This was really, really salty despite leaving the salt out of the recipe and using more than 6 cups of popcorn. We may try again, but will use no more than 1/4 Cup seasoning and double the popcorn. Yeah, that is one of the drawbacks of cheddar cheese in powdered form, you are sort of stuck because if you use much less powder the cheddar flavor won’t come through, but the more you use the more sodium. I think Cheddar popcorn is just one of those places it is hard to control the salt. What variety of cheddar powder did you use? I’ve never had someone tell me it was overly salty before. I can’t remember the brand, but it was the only one available. I’ve tried looking online to see if we could find one with less sodium, because other than that, we liked it. Oh my goodness!!! That nacho seasoning one sounds like a flavored salt, I really like the one I linked to because it is actual cheddar cheese 🙂 Oh man you guys must have made some very puckered faces when eating that! Our family loves flavored poocorn! I usually pop on the stove but I do keep a few bags of microwave popcorn around. I wanted to make smaller batches while trying this recipe out so I used a bag of Orville’s (3.5) and McCormic mac n cheese powder from Costco. The powder was slightly sweet?! Like biting into KerryGold cheese. I was going for more of a traditional cheddar and for the second batch fingured out to use half the cheese powder, keep the mustard the same, and add a few pinches of smoked paprika. Tasting the powder as I mixed it helped to determine if that odd sweetness had been cut. Smoked paprika added a sour/smoky hint that the powder was lacking. Adding popcorn salt at the end helped to dial in on the right saltiness. I know I totally altered the original ingredients in this recipe but I needed a place to start from with what I had. I think mac n cheese powder can work but next time I’ll buy the one you recommend here. Love that you were comfortable enough to play with it and customize it to your liking! Sometimes that’s the fun of it….well, then getting to eat it too! For the 4 Tb. melted butter, can we use Orville Redenbacher’s popping & topping buttery flavored oil or is there a noticeable difference from using actual melted butter? I want to make it good, close to Garrett’s (be great if it was better!). 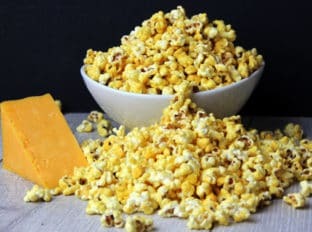 Is there a specific brand of butter that would work best for making an amazing cheddar popcorn? I was going to skip popping kernels and instead do Pop Secret Homestyle microwave popcorn. I have had both regular pop and microwave, and I honestly prefer the taste and texture of microwave popcorn lol. I know everyone online is against it but I like microwave popcorn lol. But my question is how to handle the butter. Kernel seasonings has cheddar powder but I’ll probably just buy Barry Farms Cheddar Cheese Powder as it has amazing reviews. So I definitely suggest skipping the Kernal Seasonings brand, I have it too and its not really a good flavor. Go for the Barry Farms one. 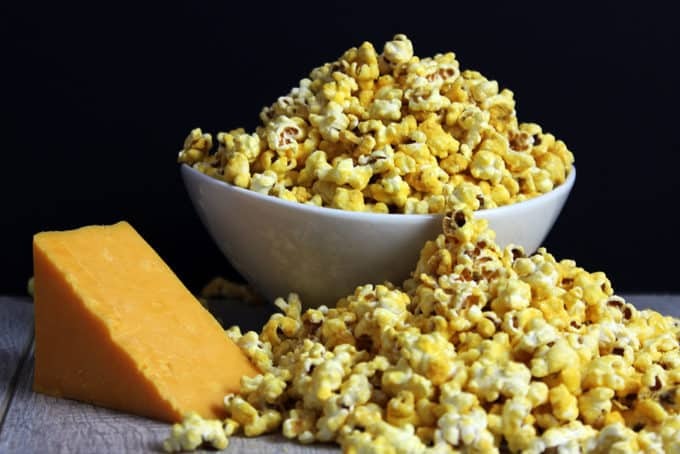 With the microwave popcorn, if you have an unflavored simple popcorn I could see it being a good option, but if it is butter flavored I would say it would interfere with the flavors. The recipe really shines when you let the butter and cheddar powder shine together, so I can’t comment on the buttery flavored oil as I haven’t tried that. 🙂 Hope that helps.